Ivy Brambles Ramblings: A Star Studded Gawain! Some of you may be familiar with the gorgeous Gawain sweater pattern by the fabulous designer Alison Green Will, certainly we were, hence why we asked Kelly to knit one up in our Superwash Worsted in the Coppermine colorway. 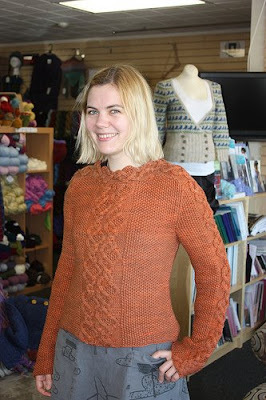 What we didn't expect was a surprise visit from designer Ysolda Teague to our local yarn store, and the offer to model the sweater for us by none other than the celebrated young Scottish designer herself. Ysolda was on a trip to the US promoting her new book which I understand sold out within a few minutes of her visit to the store. Unfortunately I was unable to be there myself but look forward to meeting her in the fall to see what she has done with some of our yarns! Gawain knit up very nicely in Coppermine, the cables held up very well knit to gauge with no sacrifice in the softness of the yarn. We will be bringing this garment with us to TNNA in Ohio in two weeks time, and to The Knitter Connection that follows. See you there!